What is enough power? That may be an impossible question to answer, but we know about how much power this 1991 Nissan 300ZX makes and it is nearly 300 more than a Hellcat. Yes, you read that right, to be more accurate, at the time of writing this the dyno sheet reads 982 wheel horsepower on a hot Phoenix day pushing intake air temps up and a dyno that was maxing out. Ben, the owner of this car, is a long time friend and I have been following his Z projects for years. 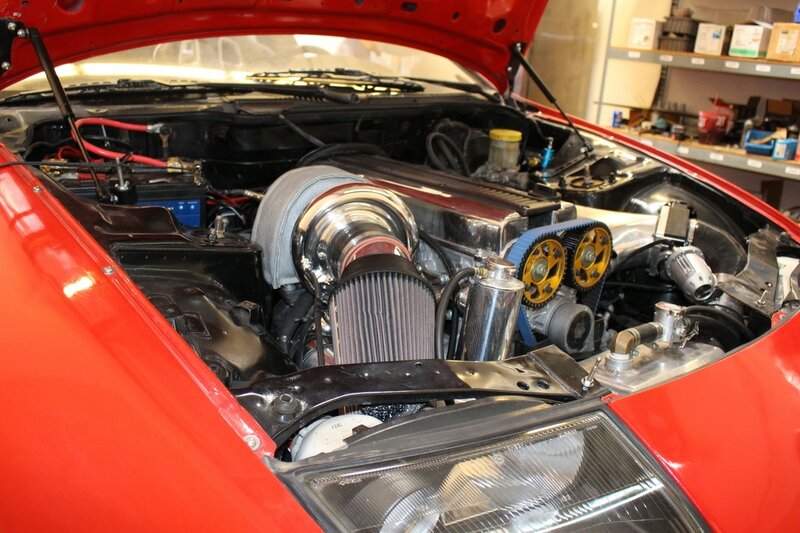 Before the 2JZ found its way into this red Z32 chassis he had swapped a VQ45DE V8 into a black Z32 and added a supercharger for good measure. This certainly isn't his first foray into high horsepower Zs, but it is certainly the most extreme. When he told me he was taking it back out to do a shake down in some half-mile racing I couldn't pass up the chance to see it in person. Even if that meant a 2,800 mile road trip. The chassis for this build came as a partial trade for his prior V8 project car and started life as a 1991 non-turbo car. Other than modifications to make a completely different engine and transmission fit in the car, and items to help the rear wheels grapple for traction, the body is mostly stock. The Z32 300ZX cars were naturally facing approximately a 0.31 to 0.32 drag coefficient due to the wide, low, profile of the car and a natural tendency to stay planted on the ground at high speeds. Good traits to have if you are looking to push one to obscene speeds in a short amount of time without the front end deciding to change around and pretend it is the back end for a short stint. Shoe horning the large straight 6 cylinder in place of a squat V6 is no small feat. Freed Engineering engine mounts were sourced to give the lump of iron a place to rest and a custom transmission mount was crafted to support the weight of the gear box rather than relying on the traditional hopes and dreams. Keen observers or 2JZ aficionados will notice that the engine is not exactly an out of the box 2JZGTE. The engine is comprised of a 1JZGTE head planted onto a 2JZGE bottom end to produce a higher compression ratio. As magical as the 2JZ platform maybe, a slight compression bump does not account for moving a 250-300 horse power engine up into the 1000 horse power range, so other trickery is taking place. A big ingredient of the power recipe (literally and figuratively) is the turbo. Compressing air to within an inch of its life is a Borg-Warner S369SXE mounted up high enough to seriously worry those closing the hood and is hanging on 521 stainless steel manifold. Tasked with undoing all the efforts of the turbo to super heat the air is a water to air intercooler tucked just behind the radiator in the engine bay. The final tune before my time with the car was at 35 PSI with very high intake air temperatures due to an improperly installed fan. Instructions are important people, even if they are in Chinese. Whatever air is forced into the engine must be killed with fire, I mean burned efficiently by mixing fuel. A lot of air means a lot of fuel, and running E85 means even more fuel. Six 1600cc injectors do the job well fed by dual Walbro 485 in tank fuel pumps. Although common internet wisdom would say 1600cc is too small for this application, there have been no fueling issues to date and Ben has no plans to size up in the near future. Ensuring the air and fuel meets efficiently and has somewhere to explode as intended without escaping, the head has undergone a stage 2 port and polish and was introduced to the block with a new Cometic head gasket and ARP head studs. Brian Crower parts are sprinkled through out the freshly reworked heads. 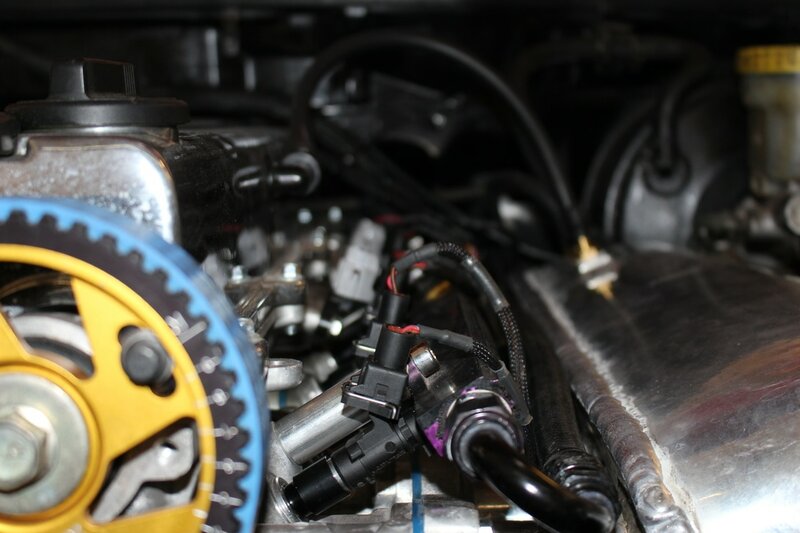 Up top you will find BC 272 cams, BC titanium retainers, BC titanium springs, and BC cam gears. The custom intake manifold suffered a weld failure on the dyno only days before I was to come see the car and it was to run in the Omega Motorsport NoFlyArizona event. Fortunately, the tuning shop was able to pound it back into shape and lay a heavy repair weld all the way around the plating. The brains behind the whole power plant is an AEM Infinity unit. Connecting the AEM brain to the rest of the engine is a Wiring Specialties harness. Transferring the power from the engine is a CD009 6 speed transmission from a 350Z feeding a custom made one piece drive line. That power is then translated to the rear wheels by an R230 viscous LSD that you would find under a stock 300HP twin turbo 300ZX of the day. Obviously Nissan fully expected the differential to face the torment of a 1000 horse power Toyota engine one day. Finally, a pair of 315/30R18 Hoosiers mounted on 18 inch LMGT4 wheels scramble for grip at the end of the equation. 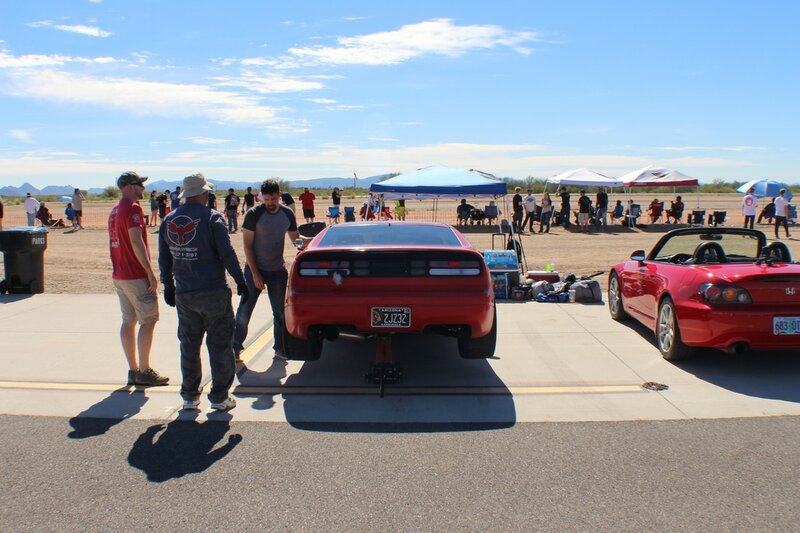 The non-turbo sub-frame and bushings were shown to be a weak link at the prior event, so Ben swapped an entire sub-frame from a twin turbo 300ZX and used Whiteline polyurethane bushings to stiffen things up for this event. In true race car fashion, after my 1300 mile drive to see and play with it, it refused to cooperate. We arrived at the track at 9:30 in the morning to great weather and a good turn out. The car had been put back together the night before mechanically, but nothing had been done yet to double check that the high intake air temperatures seen on the dyno were gone. Ben decided to dedicate the first run to logging the temps from the AEM Infinity on the first pass, so I set out to follow along in the S2000 I had driven down in from Oregon. To say a mostly stock (K&N intake and Tanabe Medallion cat-back exhaust) S2000 is out matched in a straight line against a nearly 1000 wheel horsepower 300ZX is an understatement. My objectives in the race were simple: don't let the monster Z slide into my car if he loses control and don't break anything before the return trip. Seemed simple enough. I left the line "gingerly" to say the least, not even getting into VTEC until well past the cones marking the start of the half mile. Ben left in something more of a hurry for his "relaxed" logging pass. Multiple times the rear end stepped out on the Z, making me glad my car was slow enough to not be directly beside him should everything go wrong. Well before the end of the 1/2 mile, Ben had backed off the throttle to the point I actually trapped a much higher speed and blew past him at the end of the track as you can see in the video. That made it pretty clear the car was not going to cooperate today. On the next pass the car was having less traction issues, but Ben believed the alignment was way too far off and the car felt like the back end was jumping around. Back in the pits the car went up on a jack and everyone crowded around to make somewhat educated guesses at what could be the issue. At one point or another I'm sure every piece of safety advice ever given for working on cars was ignored in order to try to diagnose the problem. After some slow driving around the parking lot, it was determined the rear end was as good as it could be in a parking lot and that he would try another pass. After the third run it was clear there were more issues at play. The car was not building boost as it should and when it did, it wasn't getting traction even as well as it had in the past. It was at this point that the day effectively ended for the Z and we just did passes in the S2000 for fun. While the S2000 may not have had 1000 horse power, it did have something almost equally good: working air conditioning. 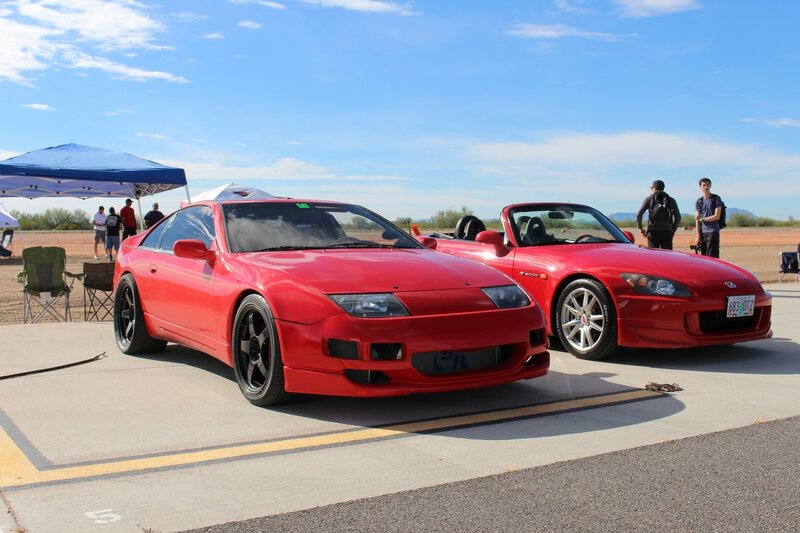 At the end of the day we had a great time and the 300ZX continued to make the usual race car steps toward becoming a true straight line weapon. For the record, the S2000 was able to trap a respectable 120.9 MPH without hard launches (couldn't break the ride home). Hopefully I will be able to make it back down to the next event Ben runs the car at, or even better, maybe I will be able to convince him to run it up here in Oregon where I will be better able to prepare to capture media for all of you!